The Skellig Islands are located 8 miles from Portmagee. 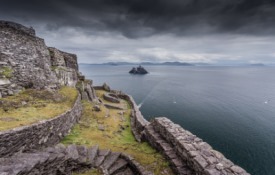 Skellig Michael is home to a well preserved sixteenth century monastic settlement, now designated as a UNESCO World Heritage Site. Small Skellig is known for its ornithology and is home to the second largest colony of Gannets in the world.